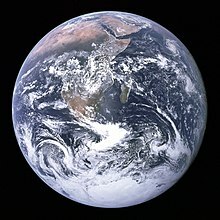 The Earth has been placed out of order with the other planets because, by studying the Earth, we can become familiar with general principles that can thus be applied to other planets. A Wikibookian suggests that Electronics/Atmosphere be merged into this book or chapter. The Earth has been shrouded in a thin layer of gases for most of its history. However, the nature and composition of these gases has changed significantly over time. At its initial formation, the Earth's first atmosphere was composed primarily of the light elements hydrogen and helium. However, at the temperatures in the inner solar system, these atoms had sufficient energies to exceed Earth's escape velocity. Earth's gravity was, therefore, not sufficient to hold these gases, which quickly escaped into space. Earth's second atmosphere was generated by gases that had been trapped within the rocks making up the body of the planet, but escaped due to volcanic activity, a process known as "outgassing". The components of this atmosphere were primarily carbon dioxide, water, and lesser amounts of nitrogen. As the Earth cooled, however, much of the water vapor precipitated out of the air, and areas of liquid water formed on its surface. Much of the carbon dioxide dissolved into the liquid water. Much of this carbon dioxide was later bound up in various aquatic life forms, and then deposited with the remains of those lifeforms in ocean sediment, eventually forming large limestone deposits. As life evolved on the planet's surface, some of the remaining carbon dioxide was converted by these organisms into oxygen, through photosynthesis and similar processes. This had the effect of further lowering carbon dioxide levels, leaving nitrogen as the primary constituent of the atmosphere, and adding in substantial amounts of oxygen. Thus Earth's third atmosphere was formed as we know it today: primarily nitrogen, oxygen, water vapor and various trace molecules in lesser amounts.